I had a friend recently ask on Facebook if anyone had an recommendation between the Samsung Galaxy S7 and the Apple IPhone 7/7 Plus. I spend a lot of time reviewing and testing phones so I thought I would write down some of what I have learned. They are both great phones and this article is not meant to push one over the other but rather to show that it depends on what you are looking for in a phone. With that said here are the pros and cons of each. Battery Life. IPhone simply has more dependable battery life. By dependable I am basically referring to stand by time (that time when your screen is off). It's very easy to use your S7 for a few weeks and then, one day, you turn off the screen with your battery at 70% and wake it up two hours later with your battery at 55%. This is not really the phones fault; it's the fault of the OS. The S7 has good battery life but the way the Android OS is structured means that apps you install can leave behind services that run all the time. Recent updates to Android have tried to address this and Google itself has said they realize this is a significant problem and are trying to fix it. Battery Usage Reporting. To go along with battery life the reporting of what is eating your battery is 1000% better on IPhone. Both systems have an area that lists apps that have used your battery along with a usage graph. However on Android the data never seems complete and much of the usage is hidden behind cryptic process names like "Android System". I've been in technology for 30 years and very often can't figure out the Android battery usage meter. With IPhone it's very simple and will actually tell you how long each app was on screen. Truly useful. Apps are better. Yes the Google Play Store has tons of apps but the apps in the Apple App Store are normally much better. There are certain apps that simply don't work on IPhone (like lock screens or replacement text messaging apps) but apps like Facebook, Twitter, etc are typically better on IOS. Voice interactions. This is a big one for me as I really enjoy interacting with my phone using my voice especially with my headphones. There are many use cases. You are at a soccer game listening to music and you want to text a friend or you want to find out if that local diner is still open. Ok Google can be made to work on the Galaxy S7 but out of the box it uses a voice assistant called S-Voice. S -Voice is terrible compared to Siri or Ok Google. As I said you can get Ok Google to work on the Galaxy S7 and that mitigates this a bit but I've found Siri to be a bit better in this regard. Always On Voice Wakeup. This one is a no brainer. With this feature your phone is always listening for a special phrase to wake it up and give it commands. With the Galaxy S7 you can customize the wake up phrase so you can use something like 'Hey Jarvis' if you wanted to whereas with the IPhone you have to use the phrase 'Hey Siri'. The problem is that the S7 only supports voice wake with S-Voice and, as I said before, S-Voice is terrible. You don't want to use that. This makes voice wake on the S7 a non starter. Messaging - Both platforms have tons of messaging apps (Facebook Messenger, WhatsApp, etc, etc). What really sets the IPhone apart here is iMessage. Apple has added iMessage apps and they are crazy. Not only can you send animated gifs but there are over 1000 apps that you can play with your other IPhone friends right inside iMessage. 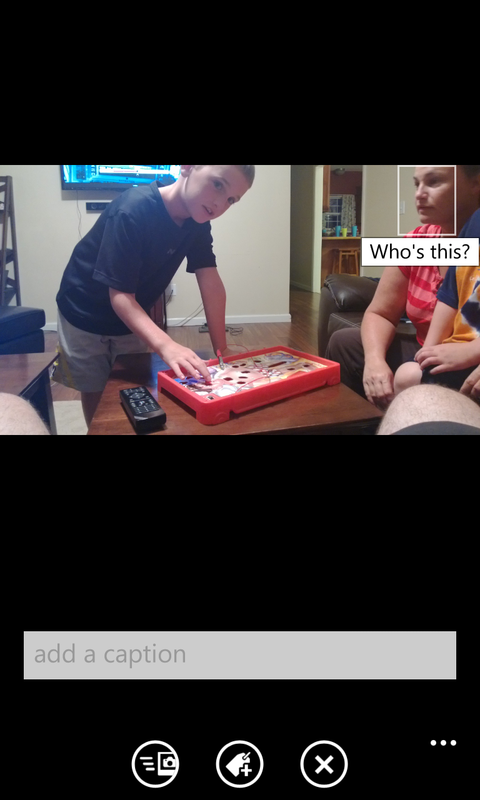 You can send move times, sports scores, even create your own JibJab gif with your own face. Very fun. Security and updates - Apple's IOS is known to be a bit more secure than Android with more frequent updates. I've already received 3 updates to iOS 10 just in the last 4-6 weeks. With the Galaxy S7 you will not get updates that often and it may take months to get on the latest OS (Nougat). Faster - Whether it's looking at Antutu scores, GFXBench scores, or SunSpider scores the IPhone are simply faster, sometimes by a lot. Camera - The S7 does have a better camera, slightly. DxoMark scores the S7 camera at an 88 and IPhone 7 at 86. What this means is they are both great but the average user will love them both. Always On Display - This is like the old Nokia Glance screen. You can set things like calendar and notifications to show on the screen even when the screen is off. This is a useful feature and allows you to see if you have missed a call or text just by glancing at your screen with no need to actually turn the screen on. This feature doesn't work with every app; in fact it really only works with Samsung apps but it is useful. Gear VR - The Galaxy S7 has a high enough display that it works well with the Gear VR headset. This means that you can use the headset to play games in VR space. This is fun and compelling. Flexibility of Android - Android is more flexible allowing some things that IOS simply doesn't allow. One example is changing out lock screens or having apps that automatically change your wallpaper on a schedule. Another example is having a launcher that includes an app drawer. This makes it much easier to organize your app icons. Widgets -- This is a feature of Android and not specifically the S7. Widgets are cool though I don't typically use them. This are basically small mini apps that sit on your 'desktop' . Wireless charging - The S7 supports wireless charging. This does help to declutter your nightstand. Waterproof - While the S7 is touted as being IP68 certified and IPhone 7 is only IP67 certified, tests have shown that the IPhone 7 actually survives in deeper water than the S7. I wouldn't want to test this personally but this appears to be a push. Headphone jack - Yes Apple removed the headphone jack on the IPhone 7. They include a set of headphones in the box that work with the phone and an adapter that allows it to work with any headphones but quite a few folks are still a bit dismayed at this choice. It doesn't bother me because moving from analog to digital headphones should bring better quality aidio and more features and we are already seeing IPhone 7 compatible headphones come on the market. This may seem like a negative against the IPhone 7 but I consider it a wash at the moment. Third party keyboards - Both platforms support 3rd party keyboards but Android has many more choices. The other thing to be aware of is that at the time of this writing third party keyboards on iOS are not allowed to present the voice dictation button. I really dislike this as voice dictation is something I use from time to time. Chromecasting - We love casting videos and movies to our Nexus Players or Chromecast devices and that works from either device. I've left out many things like mail apps, etc that basically come down to personal preference. As I said at the start of this article they are both great devices but if I was pressed to pick a device for my mom it would be an IPhone. The experience is just more dependable and in most cases better. I consider myself a Windows Phone guy. I used a Samsung Focus, a Lumia 920, and recently I've carried a 1520 for over 1 year. I've told myself that there is no significant app gap. I say that because I look at my phone and see both a Twitter and Facebook icon. However there is more to the story. Here are a handful of apps that I use both on my Lumia 1520 and my Galaxy S5. 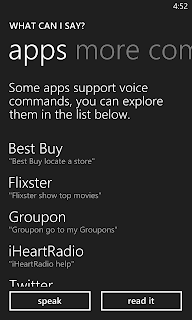 I've tried to list a few areas where the Windows phone variant falls down. I could go on and on but you get the picture. Yes, there are many apps that do not exist in the Windows phone marketplace but even the apps that are there are generally quite bad when compared to their Android or IOS counterpart. I'm a Windows phone fan and want it to succeed but there is an app gap and don't let anyone tell you there isn't. Recently we have heard about the ruling from the National Labor Relations Board allowing the Northwestern football players to unionize. Many have argued that the players are "forced" to play for a school that is making millions from their effort and for a coach that is also making millions. So why not give the players a cut of it? While I'm not an expert on the matter I think I've got some pretty strong arguments why this shouldn't be allowed. I'm sure that D-1 college athletes have expenses that are directly related to their sport. Insurance comes to mind. Travel expenses also. I'm sure the school covers most of these and they should cover all of them. College athletes are getting paid in several different ways. First, let's consider the scholarship. For many schools this amounts to a tremendous amount of money where an out of state student tuition with room and board might approach $50,000 annually. When you factor in the future monetary benefit of having at least a partial degree then the compensatory amount goes up dramatically. The next way a college athlete gets paid is in exposure. This benefit will apply to some more than others -- Julius Randle receives more and benefits more from exposure than Jon Hood (both from the UK roster). To understand this benefit let's look at the goals of these players. Take Andrew Wiggins for example. Coming out of high school he was not old enough to go directly to the pros. That leaves him with a few options such as play in college, play overseas, or don't play at all. It's easy to see that the first option with all of it's national TV time and exposure to NBA recruiters greatly increases his value to the league. Where would Wiggins be drafted if he flipped burgers for a year or played in Israel until he became old enough? Would he still go #1? The difference between pick #1 and pick #10 can be millions and at least part of that can be directly attributed to the Kansas Jayhawks and the exposure they provided to him. Providing a stage for a star to dance on is valuable compensation. What kind of payday did Doug McDermott earn with the stage that Creighton gave him? Another method of compensation for these athletes is training. Again, remember that the NBA has an age limit and rules that specify that US players must be at least 19 and one year removed from their high school class to be eligible. So, again, let's look at the options a kid has during that 1 year they are spending after high school before they are eligible for the NBA. They can play college ball, flip burgers, or play internationally. Which one provides them the best training and coaching to prepare them for the NBA? Let's say a kid decides to flip burgers for the year but hire Rick Pitino as a personal trainer and coach? Assuming he even could hire him what would it cost? When basketball and football players get years of weight training, strength training, coaching, and psychological training (got to get their minds right!) all for free then that is a very valuable form of compensation. Look at all the basketball and football pros that were relative unknowns in the college ranks but through the coaching and training provided they are now making millions in the professional ranks. Still think they are not getting paid? Now for a minute let's talk about other sports. At most schools football and basketball pay all the bills. I saw a stat recently that said something like 19 sports at the University of Kentucky are completely reliant on monies from basketball and football for their very existence. So if you start paying (as in handing them a check) basketball and football players, these schools will have no choice but to either raise tuition on everyone or cut back on these other sports or scholarships for these other sports. As a parent of a kid who got a partial softball scholarship I would be pissed to be told that my child couldn't get that scholarship or she had to pay a higher tuition because the school had to pay their football players a weekly wage and then watch some of those football players go pro and earn millions. 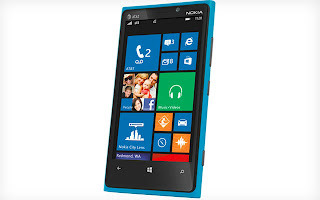 In part 1 and part 2 of this article I have covered several aspects of Windows Phone that I think make it really shine. I'm sure I could also write a similar article about IOS and Android but I'm digging Windows Phone these days so I'll leave that work for someone else. In this last installment I'll cover a few remaining elements that I really like. Probably the most important thing to me when talking about a mobile phone is battery life. It hasn't been long ago that we carried "feature" phones, flip phones, candy bar phones, etc and they lasted days and days on a charge. You really couldn't do much with them besides make a call so the long battery life was understandable. These days with processors getting more powerful, screens getting larger,and apps and games getting more demanding it's harder then ever to get that battery to last. There are many factors that contribute to battery life such as how long the screen is on, how many apps are running in the background, how strong your cell signal is, etc. Many of these you really can't control such as cell signal and screen on time. I mean we need the screen on when we are using the phone right? All platforms take really different approaches to limiting how apps run in the background although Windows Phone and IOS are the most similar. Essentially when you hit the home button on your Windows Phone then the app is immediately "frozen" in it's current state. Apps can register to have an action run on a periodic basis in the background but there are tight constraints on how often it can run, how long it can run, and how many of these "agents" can be installed at one time. The entire point of this is to preserve battery life and user experience. Those of us that have had laggy Android experiences can appreciate it. 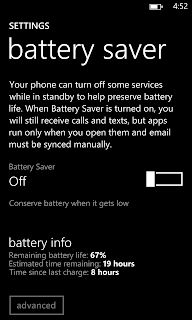 So the battery life on Windows Phone is always good, right? Well, not always. Like any other platform you can have apps that do bad things and eat battery. However I will say that battery life on IOS and Windows Phone is generally acceptable and I find myself not really worrying about the battery life on those devices. By example I had a very hard time getting my Galaxy S3 to drain at less than 4% per hour even when doing nothing whereas I often see my Lumia draining at 2% per hour during times of very light use. There is also the peace of mind knowing that games and apps are not running in the background when you don't want them to. So often I hear others talk about forgetting to kill an app on Android and it eat all their battery. 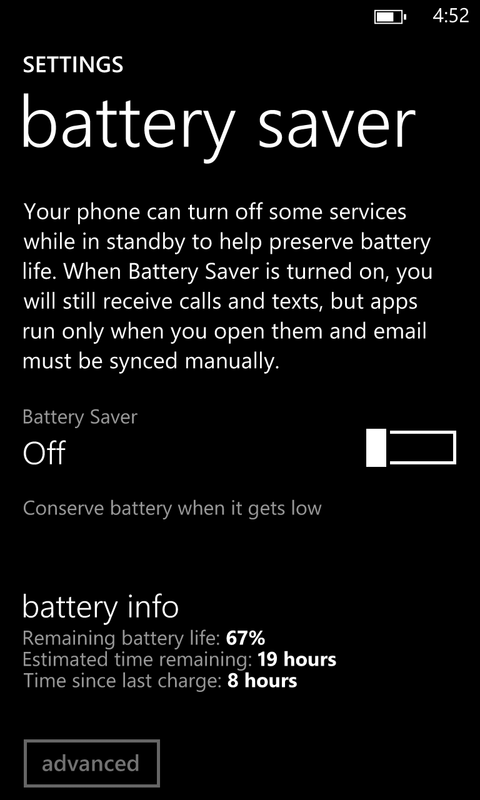 So while it's not amazingly better I do think that battery life (at least on the Lumia 920) is generally very good. The Best Buy app installed on my phone has some actions registered. One of them is "find nearest store". So you can activate the speech system and say "Best Buy - find nearest store" and the Best Buy app will launch and do just that. Nifty. The ABC app has keywords to take you to certain sections of their news app. Twitter app has phrases to start a new tweet. 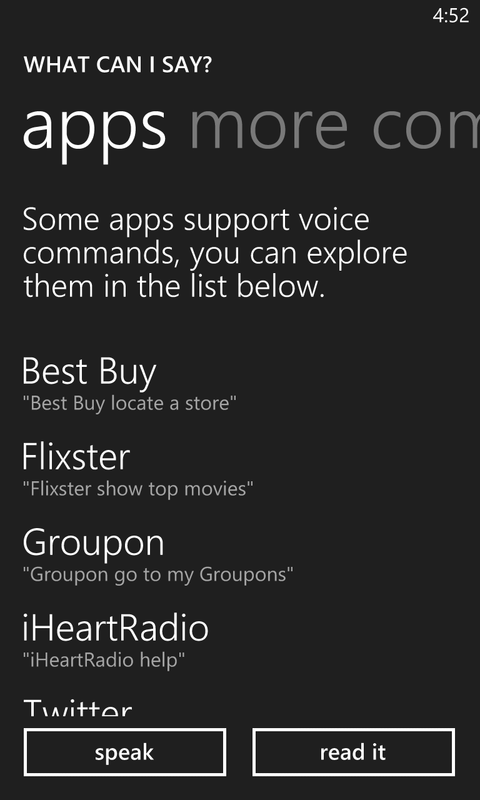 Where this is being under utilized is that apps are not continuing the interaction by voice. This is actually a fault with many voice assistant apps on all platforms. Many will let you dictate by voice and then ask you if what is on screen is correct. Man, if I was free to look at the screen I likely wouldn't be using my voice to start with. Once an app has been triggered via voice it needs to complete the interaction verbally. The Twitter app should be activated with "Twitter, send new tweet". It should then show the new tweet screen but then respond with "ok, say what you want to tweet". It then listens and converts to text what you say (yes we know this is always accurate) and then reads it back to you. If ok, asks if you want to tweet it. You know the rest. This is a small issue as developers are free to add this capability on their own. The key part is already there and that is the central voice system that allows apps to extend it very easily. The *only* platform that has that is Windows Phone. In part 1 of this article I outlined a few of the reasons why I am really starting to enjoy my Windows phone. In this followup I'll continue that and describe a few more of those reasons. I'll reiterate here that this is not a review of Windows Phone 8 nor is it a treatise on why it's the best phone OS. I happen to think that each of the 3 major phone systems are great and have their target audience. I'm only intending to outline what makes me smile about Windows Phone. The next area I'd like to highlight is Office. Like it or not, the world runs on Microsoft Office. My company slings around Excel and Word documents. My daughter complained the other day that she didn't have Office on her computer and that meant she couldn't interact properly with her college professors. Office runs business, plain and simple. 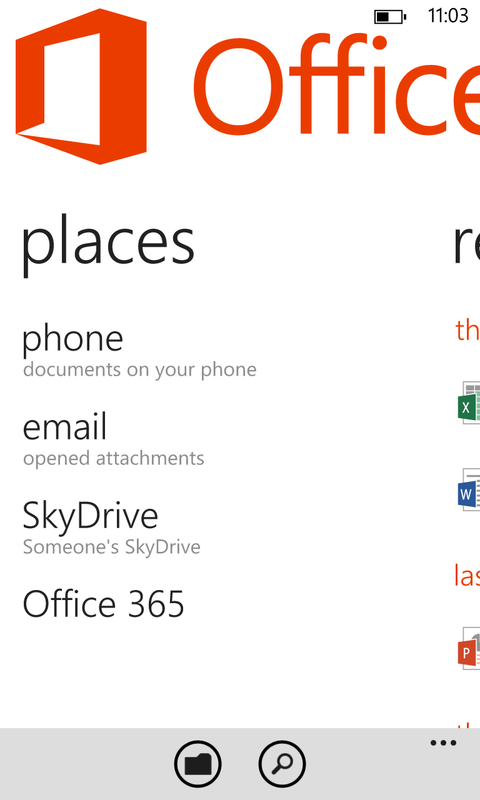 And Windows Phone has Office built right in. Samsung and the other Android phone makers often do include office suites that do a remarkably good job with office compatibility however all it takes is one bad experience with formatting or losing a page or two in your power point for you to realize that "almost 100% compatible" can be very frustrating. You combine Office with the seamless integration with SkyDrive and you get a very nice mobile workplace. I'm not spending much time talking about Office as it really "just works" and is one of the best spreadsheet and document editor experiences you'll find on a mobile phone. Where it really shines is when you mix in SkyDrive. 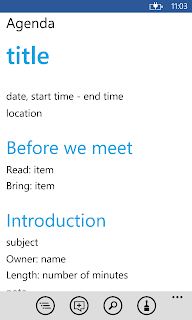 When you open up Office on the phone you are met with a Recents list that spans documents on your phone or in the cloud. No differences are made and opening a document from the cloud will check that you have the latest before opening and automatically save it back to the cloud when done. You don't ever have to worry about manually syncing a folder. Trying to set up something similar on my Galaxy is harder. You can install an office suite (like KingSoft) and even open documents right from sites like Dropbox however saving the files didn't appear to push them back to Dropbox automatically. Yes, I could setup some auto syncing of Dropbox with a folder but none of this is automatic and can be challenging for a new user (like your mom!) to setup. And, even once you got it running, you still have something that is "mostly compatible" with Office. 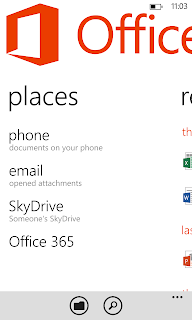 Being 100% compatible with Office and seamless integration with the cloud makes Office and SkyDrive a killer story for Windows Phone 8. Windows 8.1 is making the story even sweeter with even better integration of SkyDrive with Windows on tablets, laptops, and desktops. Installing Office on these other computers now means that you can edit your Office files wherever you are without any concern about breaking compatibility or that you are editing an older version. Peace of mind is worth a lot! Windows Phone does a great job of pulling photos together from several different sources into a single location. Everyone manages their photos in a different way. 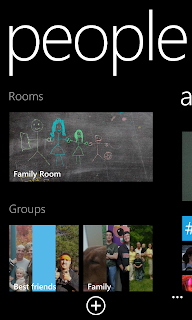 On my Lumia you can go into the Photos app and choose Albums and you'll see all the photo albums I have on my phone, on my SkyDrive, and on Facebook all in one location. No need to open each of these apps separately. And, while it hasn't been utilized a great deal, I think other apps can take advantage of this as well. The next call out here is automatic, full resolution, upload of your photos and videos to SkyDrive. It's a ton of fun to take a bunch of pics, come home and grab some dinner (while your phone uploads all the stuff you shot as soon as it hits your WiFi), and then grab your Surface RT or tablet and swish through all the shots you got right there on SkyDrive. 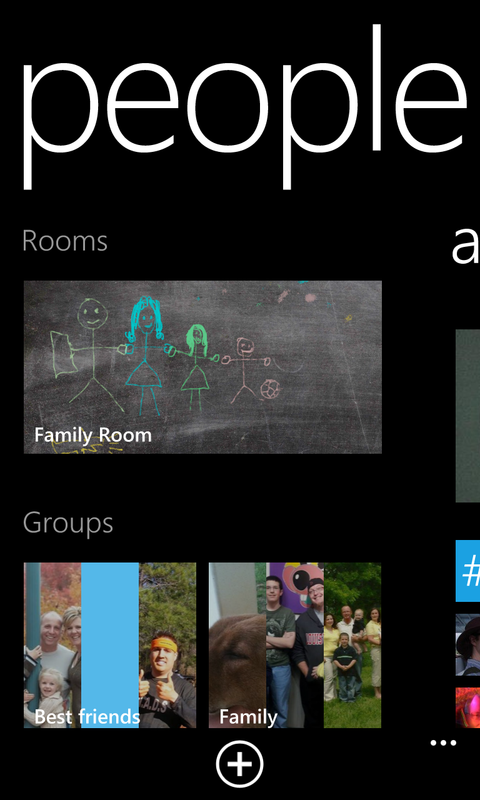 The last thing I want to mention here is how the Photos app updates the Live Tile. It's always fun to unlock you phone and see a fresh, rotating, set of pictures from your camera roll right there on the Live Tile. There is a lot to say about Facebook integration in Windows Phone so I will just highlight a few of the areas that I particularly enjoy. 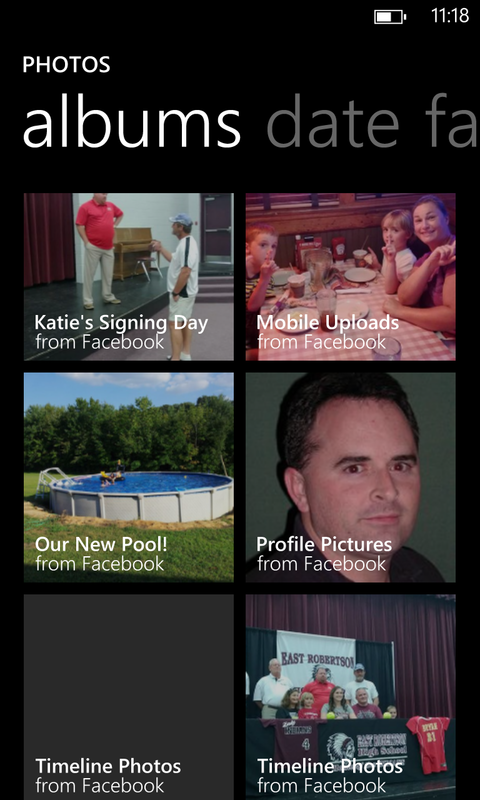 In the Me tile I can post a status update to all of my social networks at one time. I can update my status on Live Messenger, Facebook, Twitter, and LinkedIn all at one and in one place. This is great time saver. Yes, I know that Android has apps that can do this but anything integrated and built in is better in my book. 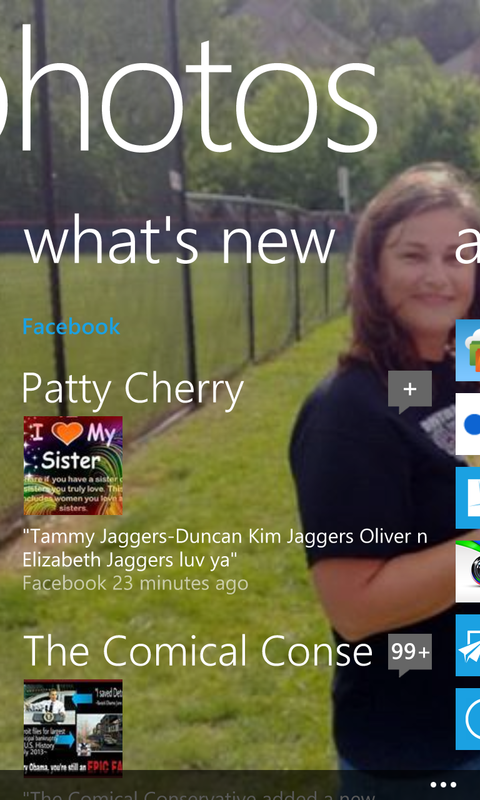 Also in the Me tile I can Facebook check in and see all my Facebook and Twitter notifications and interactions. Very handy! I've already highlighted that I can see all my Facebook photo albums just by opening the Photos app and looking in my albums. However, as you can see in the photo above, the Photos app has a What's New section that shows you all the photos that your Facebook friends are posting. Want to see that cool photo your sister posted this morning? No need to open Facebook. Just open Photos and hit What's New and there it is! One pet peeve I have of the Facebook app on Android is that I keep having to search for my family members I want to tag. No so on Windows Phone. Right from the picture I can choose share to Facebook, then click the add tag button to see a list of most recently used tags. No need to search. Love this feature! And if I want to do something more complicated I can always just crack open the Facebook app. The last thing I want to mention about Facebook integration is one of favorites. I originally didn't think I would like it but boy have I changed my mind. Windows Phone allows you to specify that an app will control what the lock screen looks like and Facebook supports this. 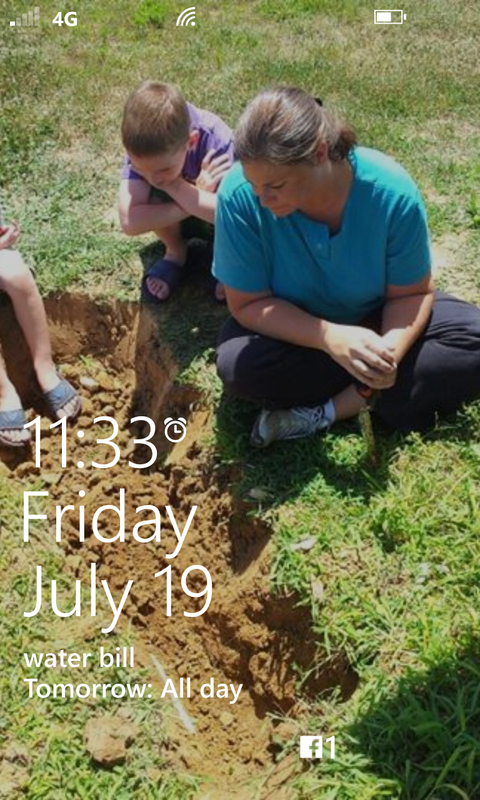 When you install Facebook and run it the first time you are given the choice to have Facebook manage the lock screen and how it should look. Now, every time I wake my phone I'm greeted with a new photo right out of my Facebook photo albums. I really can't tell you how many times I've chuckled or smiled at a photo that was on my lock screen. It rotates them many times throughout the day too so it's always fresh. 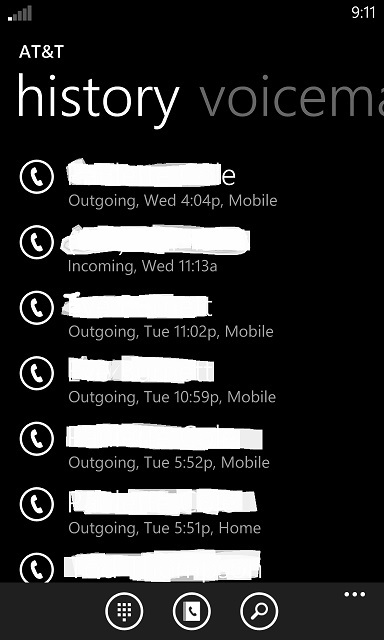 Contact handling on Windows Phone is really quite nice. It has all the same features you would expect such as grouping contacts from Facebook, Google, and others into a single directory, the ability to set custom ringtones for a contact, and edit details like birthdays, spouses, etc. However there are a couple things that really make it stand out. The first is contact grouping. You can create groups of contacts with a given name. Once you have the group you can then go into the group and email them as a group, SMS to them as a group, or see what they have been posting to their Facebook or Twitter accounts as a group. You can view their shared photos as a group. You get all the same functionality as when you are looking at all your contacts but it is filtered down to just that group. This can be very handy! And my favorite is contact profile pics from social networks. Yes, I know that some Android phone makers have done this for Facebook but I have never seen anyone do it with Facebook, Twitter, and LinkedIn and have that information flow everywhere in the system including SMS and email. It's very cool to get a phone call from your wife, see her picture full screen on your phone, and realize that she has changed her profile picture. Yes, I can manually set her contact photo to anything I like but I enjoy getting having my contacts set their profile pictures. And that wraps up part 2. In the next (and likely last) installment I'll finish up going over my favorite features with two of the best, battery life and voice commands. Talk to you soon! Back in November of 2012 I gave out a warning that I didn't think that Windows Phone would survive. I'm still not certain it will but I am more optimistic today than ever before. I've been carrying a Lumia 920 as my daily driver for most of the last two months and really have no strong desire to go back to my Galaxy S3. So I decided I should write a lengthy article on what is keeping me on the Lumia as it might be helpful to others. First let me say that you really can't go wrong with any of the current flagship devices, the IPhone 5, Galaxy S3/S4, or Lumia 920/1020 so this post is not at all about decided which one is better. I would say that each one of them is better for different types of people. I'm only writing about what I like about the Lumia 920. The Lumia devices are extremely well built. They don't have removable back plates and, like the IPhone, feel solid through and through. The color is baked into the phone so dropping it and even taking a gouge out of the body will not leave you with a scratch that is discolored. The height and width of the 920 are fine but the device really is thicker and heavier than is necessary. This is due in large part to the built-in wireless charging. While I prefer the thinness and weight of my Galaxy S3, I don't find it a deal breaker on the Lumia. It spends most of it's time in my pocket and I don't spend hours at a time holding the device to my ear. Two things that I really like about the phone dialer is the tight integration of visual voice mail and the ability to see phone numbers I have looked up by business name rather than number. First, visual voice mail is simply a swipe away. Just tap the phone icon and swipe over the voice mail section. Some Android phones may have something similar but I didn't really see it on my Galaxy S3 (which still does visual voice mail but it's a separate app from the carrier). The second thing I really like is how Windows Phone saves the name of a location I looked up to call in the call log. On most phones when you use maps to look up a business to call, the entry that appears in the call log is just the number. Later you will look at that number and not remember who you called. 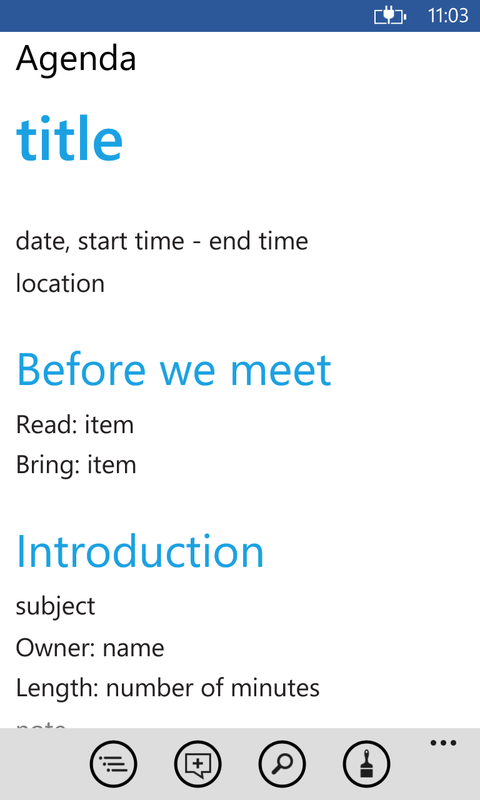 With Windows Phone you will see the actual business name in the cal log making it very clear. One other small thing I like about the call log is how I can call back the number which just a simple touch of the phone icon next to the entry. I know with the Galaxy S3/S4 you can swipe one direction to call and the other to text but there is something I prefer about a simple touch over a swipe motion. One thing that Windows Phone is missing is a T-9 dialer. It can be nice to just pull up a dial pad and start dialing the name of the person you want to call. You can do this with Android but it's missing on WP8. While Google Maps is an excellent product, there are two features about Nokia Maps on Windows Phone devices that I really want to highlight. The first is offline maps. In this connected world it's easy to think that offline maps are not important. However just a few weeks ago my wife was taking my daughter on a college visit. She was driving on local surface streets and discovered she had not cell coverage in that area. Her "blue ball" had kept moving but her maps would not update. She was lost. She had to stop and ask directions. Yes I am aware that Google maps has (had?) some type of offline map caching but it's not like Nokia maps where you can pre-download entire states and countries of mapping data that is always available to you even when you are offline. This even includes local business names. It's really impressive to show your friends that you can turn off all WiFi and cell service to your phone and *still* look up the directions to a local restaurant and navigate without any issue. The second one is really small but shows the completeness of the maps. I've heard Google make noise about "inside maps" so I did the following quick test. On both my phones I zoomed in on my local mall, Rivergate. 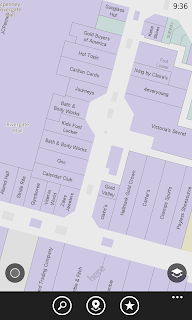 On my Galaxy S3 I could see the outline of the entire mall and the names of the 3-4 major retailers on the corners of the mall. On the Lumia I could see all that *plus* every single shop on the inside of the mall too. The complete directory with every shop correctly sized and placed. 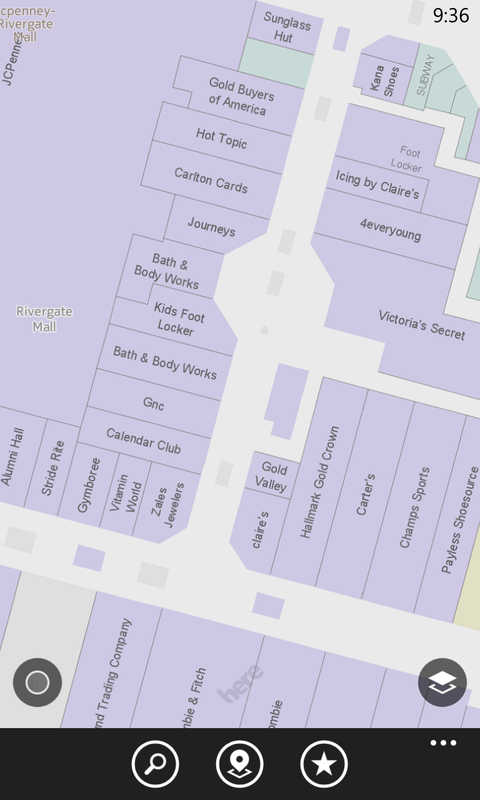 Very cool to also show your friends that you have the mall directory in your pocket. You start getting questions like "what kind of phone is that again?" Music is one area where I think Windows Phone 8 really shines right now. There are plenty of apps for playing your music. The Pandora app (now that it is finally here) is probably the best implementation of Pandora I have ever seen. I also have Spotify and iHeartRadio installed. I am using an app called CloudMuzik to access my Google music cloud. And while I'm not a subscriber, Xbox Music is baked in and is an excellent alternative to Spotify. 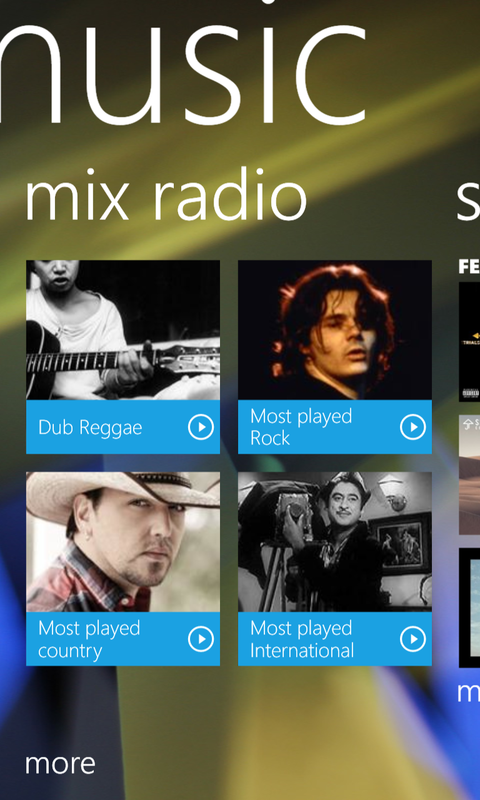 I have also heard that Amazon is bringing an Amazon Music Cloud player to WP8 very soon. The point is that unless you depend on Amazon Cloud player for your music you will really not have any trouble rocking your tunes. That being said, I want to call out two things that really make it shine for me. The first is an app, Nokia Music. I have been a Pandora user for a long time and I really love the service. However I find myself using Nokia music more and more. The main reason is there are no commercials! And speaking of commercials it is important to point out Pandora is ad-free on WP8 until 2014. While Nokia doesn't allow you fine-tune by removing songs you don't like, they do provide lots of pre-built mixes and allows you to create your own from a set of artists. You can also take these mixes offline *all for free*. This offline capability is really nice as I recently found out on my trip to Tech Ed. I was about to board one of my flights and wanted to keep listening. So I just tapped the mix I was listening to and told it to take it offline. Within just a few minutes I had 3 mixes offline that gave me between 1-2 hours of non-repetitive listening while on the plan. Very nice! Yes, I know that Spotify can do this too but Nokia Music does it for free!! The other thing to call out about Nokia Music is their Music+ offering. For $3.99 per month you can skip as many tracks as you like in your mixes and you can get lyrics to all the songs. While this is not as good as the on demand ability you get with Spotify, it is also less then half the price. Nokia Music, Pandora, and Spotify make my Lumia a musical powerhouse. The second thing I want to mention about music is the controls. No matter what app is playing background music you can get access to controls to play, pause, and (if supported) next and previous tracks just by pressing either of the volume controls and the controls slide down from the top. Yes, I realize that on Android the controls are generally available on the lock screen and in the pull down shade. However, anyone who has used Android has discovered that lock screen music controls are not a given. Pandora didn't have lock screen controls for some time on my GS3. 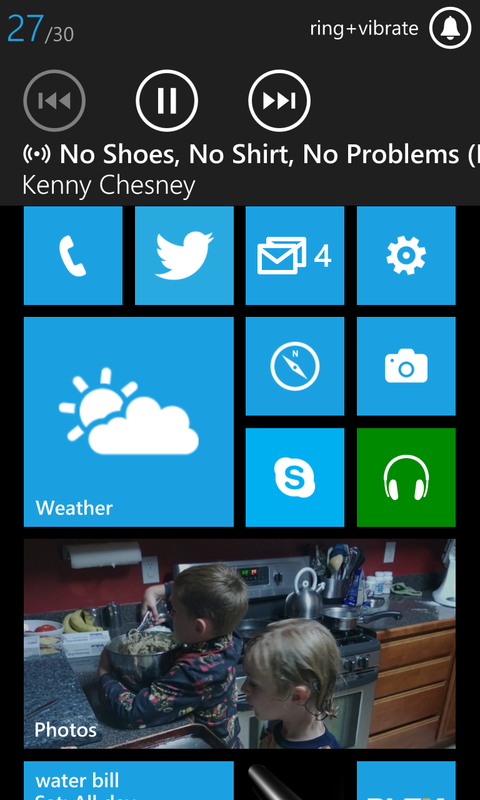 In any case, I think the music situation on WP8 is very nice and easily able to satisfy all comers. That's it for part 1. In the next installment we'll look at a few more features that make Windows Phone an excellent choice for your next phone! Windows Phone is running a distant third. We know this and we know why. Apps. There aren't any and don't believe Microsoft when they talk about 46 of the top 50 apps are there. When your friend starts playing SongPop or Ruzzle you find out those apps are not in the WP app store the fact that CNN is there is not really relevant. It's a difficult problem to solve. Platforms need apps to lure users. Apps need developers to create them. Developers need the platform to have a significant number of users to make it worth their time. And that completes the circle. But there is a way to break it and I think Microsoft has already been doing this. Now I am not aware of Microsoft's plans or actions here so if they are already doing this, great. If they aren't they need to start today!! The basic idea is "fund and completely manage the development of all leading apps on competing platforms and, for a period of time, identify new popular titles and port those as well". The main difference in my idea here is that MS needs to actually completely handle the port and support of the apps. Simply providing the money for the port is not enough because you may be dealing with dev shops that don't have the experience needed or, more likely, don't have the bandwidth. But how would this work? Here are some thoughts. Microsoft would make the app free in the marketplace for a period of time. The publisher didn't do the app in the first place so they aren't missing something they didn't have in the first place. Microsoft would handle all reported bugs and issuing updates to the program. The publisher obviously has control over whether the port is done -- it is their property. Some publishers may have philosophical reasons why they don't want to support the platform. The app would still be published under the publisher name. To the outside world it would appear that the publisher did the port. I don't know how much of this Microsoft is already doing but this is one approach that would help provide some of the missing apps for the platform.